I know, who thinks of remodeling their pool this time of the year? Well, that would be all the people that want to make sure their pool is a beautiful backyard oasis once it warms up. 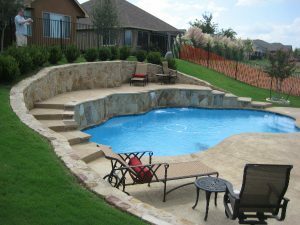 It is hard to believe, but the “off season” is a great time to take care of any pool remodeling or decking issues you may have. During the warmer months we are all busy using our pools and it is hard to block out time to drain and remodel. So, you’ve been looking out the window at a pool in disrepair; thinking to yourself -‘next year’. Or maybe it’s been costing you a bit extra in water bills because the old plaster is cracking. You know it’s time to drain the thing and get some new plaster, and maybe even some new decking and stone work. Shoot us an email, or give us a call (972.869.3333). We would be happy to come out and talk to you and provide a free consultation.